With its miles of palm-fringed beaches, hyper-luxurious resorts and beautiful colonial cities, Mexico has everything you need to get in the mood on a romantic vacation. Whether you’re looking to chill out in a palapa on a secluded beach or be pampered at a world-class spa, our rundown of the top 10 Mexican honeymoon destinations is bound to deliver something you’ll love. Best for: Unparalleled luxury on the Riviera Maya. Top stay: Rosewood Mayakoba. Thanks to its setting among acres of protected mangroves, winding canals and a mile of white-sand beachfront, this award-winning resort feels like a private little slice of paradise. Read reviews and get rates for Rosewood Mayakoba. Romantic Highlight: Being ferried by a vintage-inspired boat along a crystal-clear green lagoon to your stand-alone limestone villa. The contemporary suites feature rock showers, private plunge pools and a welcome gift of boutique tequila. Best for: Culture lovers looking for a serene hideaway in a UNESCO-listed colonial city. Cobblestone streets, gorgeously restored 18th-century homes and a picturesque mountain backdrop makes this artsy town muy romantico. Top stay: Casa de Sierra Nevada, a boutique hotel whose elegantly furnished suites are spread out across four colonial mansions. The property runs a well-regarded cooking school and has a fine-dining restaurant called Andanza that serves refined regional dishes. Read reviews and get rates for Casa de Sierra Nevada. Romantic Highlight: People-watching on the plaza, known as El Jardin, with its pink, many-spired Gothic parroquia, or church, then wandering the leafy and cool Botanic Gardens. Best for: Adventure lovers keen to explore the astounding archeological ruins of Chichén Itzá, Uxmal and Ek Balam. Top stay: Rosas y Xocolate, a new boutique hotel that’s brought a dash of international flare to the capital of the Yucatan with its hot-pink exterior, chicly understated rooms and hip rooftop bar. Read reviews and get rates for Rosas y Xocolate. Romantic Highlight: A perfect day would entail an early-morning tour of the Mayan pyramids at Chichén Itzá, followed by a cooling dip in a crystal-clear cenote (the many sinkholes that dot the peninsula) and ending with icy margaritas back on the hotel rooftop. Best for: Honeymooners looking for a fun-packed vacation in a cosmopolitan beach town. Top stay: Grand Velas All Suites & Spa Resort, a glamorous, grand-scale resort on lovely Banderas Bay. Read reviews and get rates for Grand Velas. Romantic Highlight: Taking a water taxi to Playa de las Animas, a secluded stretch of beach south of Puerto Vallarta, and feasting on fresh seafood from the beachside palapas. Best for: Couples wanting to rub shoulders with celebrities like Jennifer Aniston, George Clooney, and Jimmy Kimmel, who love this unspoiled beach hideaway. Read reviews and get rates for Las Ventanas al Paraiso. Romantic Highlight: The “Sea & Stars Pure Wellness” couples treatment at Las Ventanas – massages followed by a long soak in soothing oil-infused waters while sipping champagne. Read more about Los Cabos. Best for: Couples keen to get away from the crowds in style. Top stay: St Regis Punta Mita. The new jewel in the crown of this exclusive spit of land on the Pacific Coast offers sophisticated villa accommodation set among landscaped gardens and cascading water features. Read reviews and get rates for St Regis Punta Mita. Romantic Highlight: Chilling out all day in a butler-serviced cabana by one of the resort’s three infinity pools, while keeping an eye out for the humpback whales that ply the waters of Banderas Bay from December to April. Best for: Not far from the gated community of Punta Mita yet a world away in attitude, this fishing village is ideal for couples looking for a laid-back honeymoon with great surfing and eating. Top stay: Verana. Limestone casitas, net-draped beds and a secluded hilltop location (reached via a boat ride and mule trip) make this boutique resort and spa an unforgettably off-the-beaten-track experience. Read reviews and get rates for Verana. Romantic Highlight: Dinner beachside at the famous Don Pedro’s, a convivial seafood restaurant that exemplifies the barefoot chic of this charming town. Best for: Culture vultures seeking an authentically Mexican bohemian city experience. Top stay: Casa Oaxaca, a converted 18th-century mansion turned boutique hotel that becomes a candlelit oasis when night falls. Read reviews and get rates for Casa Oaxaca. Romantic Highlight: Strolling El Zocalo, the tranquil tree-shaded central square, and hiking the Sierra Norte highlands to visit indigenous villages. Best for: Thrill-seekers keen to immerse themselves in sophisticated Mexican urban life, with access to great galleries, fine dining restaurants, and world-class shopping. Top stay: Las Alcobas, a fashion-forward newcomer in the hip Polanco district that marries high design and creature comforts beautifully. Read reviews and get rates for Las Alcobas. Romantic Highlight: Walk in the footsteps of famous lovers Frida Kahlo and Diego Rivera, whose artistic talents left an indelible mark on the city. Marvel at the Museo Frida Kahlo (the painter’s former home) and check out Rivera’s elaborate murals at the Palacio Nacional. Best for: Nature lovers wanting an unforgettable encounter to kick off their lives together gravitate to this tiny island (pronounced Hol-bosh) just north of Cancun. 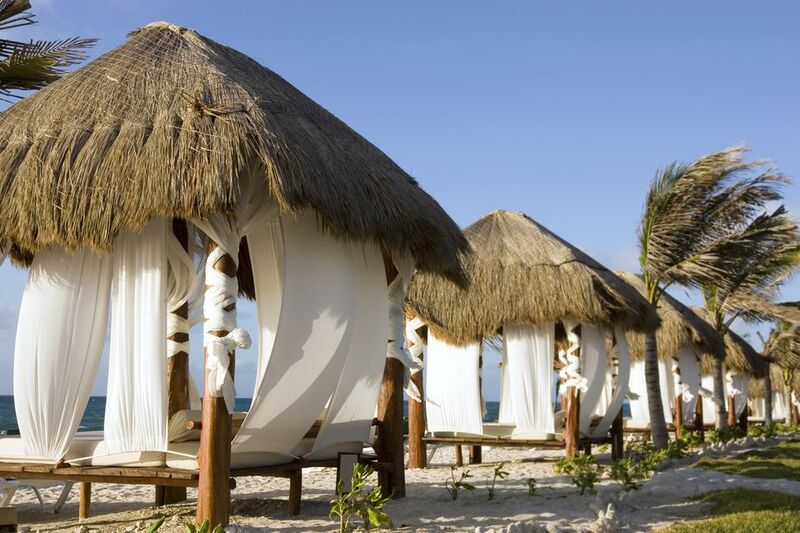 Top stay: Accommodations on the island tend to more humble than the glitzy Rivera Maya, but that’s part of the appeal. Shaded by palm trees on a white-sand beach, La Palapa hotel has a breezy, sand-between-the-toes charm. Read reviews and get rates for La Palapa. Romantic Highlight: Of all the nature-communing activities on Holbox – bird-watching, horse riding, snorkeling – by far the most memorable is swimming with whale sharks who spend the summer season in these waters (May to September).